The statements follow the opposition’s rejection of a proposal for reestablishing the dialogue, presented to both sides on January 19. On January 25 the MUD announced they found the proposal unacceptable and said they would not return to dialogue with the government until the previous agreements had been fulfilled. Giordani defended the Vatican effort from criticism, saying the text had been written by the UNASUR commission. But it did indeed have the Holy See’s support as a way to get the dialogue restarted. Given the lack of progress, the Vatican itself has diminished its public commitment to the dialogue. On January 19, it was reported that the Vatican representative, Monsignor Claudio Maria Celli, would no longer facilitate the process, leaving that to Giordani. The move is significant as Celli is considered by insiders to be one of the Pope’s highest level envoys, while Giordani is the Vatican’s permanent representative in Venezuela. 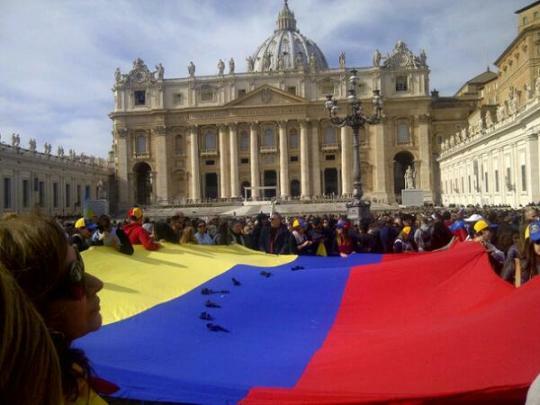 The Vatican’s unfruitful efforts represent a disappointing turn for those (of us) who thought that Vatican involvement had the potential to generate a breakthrough in the Venezuela’s political stalemate. (See our previous coverage from 2016 here and here). The Vatican became formally involved at the end of October 2016. While the possibility had been in the works for several weeks, after Vatican involvement was solicited by both sides in September, it became concrete in the days after the government suspended the opposition’s push for a recall referendum. On October 24, Pope Francisco received Nicolas Maduro at the Vatican at Maduro’s request. During the meeting, the Pope advocated for “sincere and constructive dialogue” between the government and opposition to promote “social cohesion”. That same day, Vatican representative Mons. Emil Paul Tscherrig, announced the begging of conversations between the government and the MUD the 30th of October, after having met with each side. The opposition was divided from the beginning, with Voluntad Popular and other radical parties refusing to participate. Most opposition leaders did agree to participate and this led them to call off a planned march to the Presidential Palace that likely would have ended in violence. Following the agreements, the opposition National Assembly (AN) coalition solicited the unseating of the three Amazon State deputies–a key sticking point in the government’s recognition of the AN. Their elections had been suspended in December 2015 by the TSJ because of accusations of fraud despite the National Electoral Council having accredited their elections. However, even after unseating the deputies, the government did not recognize the AN, saying the process had not taken place through the right procedure and demanding that they be stripped of their seats in a plenary session. The first of December, The Vatican sent a confidential letter to both the MUD and the government, in which it lamented the delay in the measures previously agreed upon, as well as declarations and decisions that were not facilitating reconciliation of the two sides. · Measures are immediately taken to address scarcities of food and medicine. · The National Assembly is recognized in its constitutional functions. · The situation of political prisoners is addressed. The letter suggested that the Vatican expected progress to be made on the first issue before the December 6 meeting, and concrete agreements be achieved on the last three, in the meeting. The letter produced a vitriolic response from Socialist deputy Diosdado Cabello, who called Vatican Secretary of State Pietro Parolín, author of the letter, “disrespectful” and “irresponsible.” Cabello stressed that the Vatican is a guest, a facilitator, and has no right to veto or make proposals. In response to Maduro and Cabello’s words, the Foreign Ministries of Uruguay, Peru, Paraguay, Mexico, Guatemala, Colombia, Chile, Brazil and Argentina reiterated their support for the dialogue and the ex-presdiential and Vatican mediators. These demands, which the Holy See asked to be met by December 6 still have not been met. To the contrary, in terms of elections there have been multiple setbacks (including the regime’s ratification of an illegally constituted biased Electoral Council) and likewise there have been setbacks in respect for popular sovereignty as expressed in the National Assembly, whose January 5 installation is surrounded by threats of not being recognized and by aggression from government leaders. Just as important, with respect to political prisoners and attention to the victims of the humanitarian crisis, there have been timid and insufficient efforts, that do not represent a real reparation for the damages nor help to the victims in the dimensions and seriousness that the crisis requires. The letter concluded that given the lack of progress on these demands, there were no grounds for to return to the dialogue table on January 13 as planned, but requested that the Vatican stay involved and confirm that the agreements had not be fufilled. On his February 5 edition of “Sunday with Maduro,” the president suggested that a comission was seeking a meeting between the government and the opposition directly with the Pope in the Vatican (watch from 7:10-8:10). It is clear that for the government, having the Vatican involved is a useful way to signal to the international community that there is some sort of democratic process underway which should not be interfered with. Not clear, however, is how much energy the Vatican is willing to dedicate to a dialogue that has borne such little fruit. Whatever the case, opposition insiders themselves have suggested that the only possibility of an advance in Vatican-led dialogue was if it were held in the Vatican itself.